Nigella sativa belongs to the family Ranunculaceae. It is an annual flowery plant originating from the Mediterranean or Western Asia. The tree has a height of 40 cm, simple or branched; the leaves are repeatedly separated and the flowers are lilac with white or pale gray color. The fruit of this plant has oblong form in which the black seeds can be found. Most people call it by different names: fennel flower, nutmeg flower, black caraway and black cumin. Today it is worldwide popular the use of extract / oil from the black seed. Black seed oil is obtained by cold extraction method. The oil is not filtered during the procedure, because it contains soft portions of the black seeds, which are very important in the treatment of many diseases. Other nations and cultures also consider the black seed as a gold mine of health; it can cure all diseases except death. In the Orient it is a common spice in the kitchen with its characteristic bitter-hot taste. The black seed helps against all types of cold ailments and helps introduce the effective ingredients of cold medications to the areas affected by hot and dry ailments, as it helps the body absorb the medicine quickly when taken in small dosages. Black seed is hot and dry in the third degree, eliminates, flatulence, extracts the helminthes (worm), relieves leprosy and phlegm fevers, opens clogs, decomposes accumulating gas and excess moisture in the stomach. Diabetes Treatment – According to an article in the Journal of Endocrinology and Metabolism, black seed causes gradual partial regeneration of pancreatic beta-cells, increases the lowered serum insulin concentrations, and decreases the elevated serum glucose.” The research on mice suggests that black cumin oil can prevent the development of type 1 diabetes, and increase the insulin sensitivity of liver cells, which helps to prevent type 2 diabetes. Supports the Immune System – As black cumin oil contains powerful antioxidants as well as beneficial B vitamins and acids, it helps to support the immune system. It’s particularly beneficial for those with autoimmune disease, as unlike the popular herbs echinacea and elderberry, it acts differently by balancing the immune system. It increases immune function without encouraging an immune reaction against healthy tissue in the body. Treats MRSA – The deadly and antibiotic-resistant bacterial infection known commonly as MRSA responded favorably to treatment with black seed in this study from the University of Health Sciences in Lahore, Pakistan. 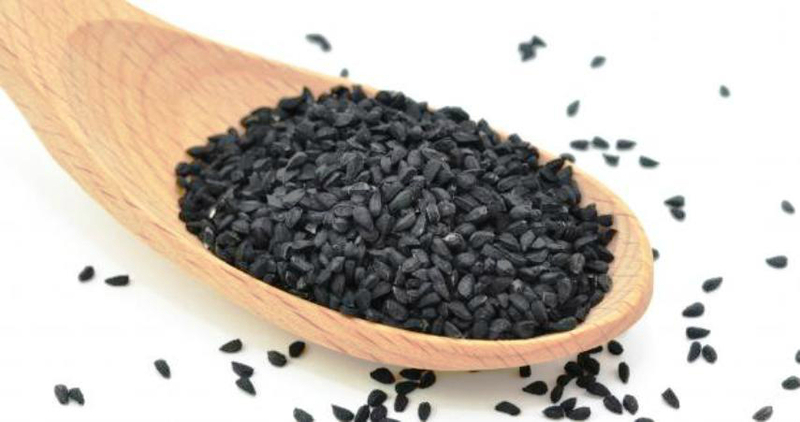 Reduces Epilepsy Seizures – Black seeds were traditionally known to have anticonvulsive properties. A 2007 study with epileptic children, whose condition was refractory to conventional drug treatment, found that a water extract significantly reduced seizure activity. Treats Colon Cancer – Cell studies have found that nigella sativa extract compares favorably to the chemoagent 5-fluoruracil in the suppression of colon cancer growth, but with a far higher safety profile. Animal research has found that black seed oil has significant inhibitory effects against colon cancer in rats, without observable side effects. Treats Asthma – Thymoquinone, one of the main active constituents within Nigella sativa (black cumin), is superior to the drug fluticasone in an animal model of asthma. Another study, this time in human subjects, found that boiled water extracts of black seed have relatively potent anti-asthmatic effect on asthmatic airways. Increases the vitality of the body and helps to overcome the daily fatigue and weakness. Helps with gases caused by gall failure. Acts anti-inflammatory, anti-pyretic, antibacterial and antiviral. Helps in the treatment of fungal infections of the feet, hands and nails. Regulates the level of the growth hormone, glucose, triglycerides and sperm. Improves the digestive system and acts in the treatment of constipation, gastric ulcer. Has effect against the inflammation of the bladder, night urination. Helps against hair loss, baldness, weak hair and premature whitening. The power of the black seed is great and it is used as a remedy for different conditions and diseases.